It has been a few weeks and I am finally getting around to the second part of my Practical Packing post. Since I actually did take a short trip last weekend it inspired me to write about this and provide visual aids. If you did not read Practical Packing Part 1, click here, read that first, and then come back. Ok, so you are now up to speed and we are ready to talk about packing your bathroom bag. I bought this from Target years ago and I really love it. It has enough room for everything you need, is easy to carry, and came with two matching cases, one for jewelry, the other for make-up. Once you zip it close, you can see it has a handle. I always pack travel size everything for the bathroom. But I only stock up on travel size items when I am NOT going away. This is because I try to avoid unnecessary extra expenses when I am about to take a trip. You already need to fill your gas tank, pay for lodging, and you will be eating out more than usual, so an extra $30-$50 trip to CVS that week isn’t the greatest timing. Save that money and do something fun with your family on your trip! So when you aren’t going away, peruse the travel-size aisle and stock up on any items you use that are on sale for $1. Here is my bathroom bag packed for last weekend’s trip. Since I am also traveling with a baby, I have even more things I have to bring along! I always save the plastic cases that pillowcases, sheets, and bedding come in. Before Olivia, I stored my crafting supplies in these. Now, they serve as baby travel kits. 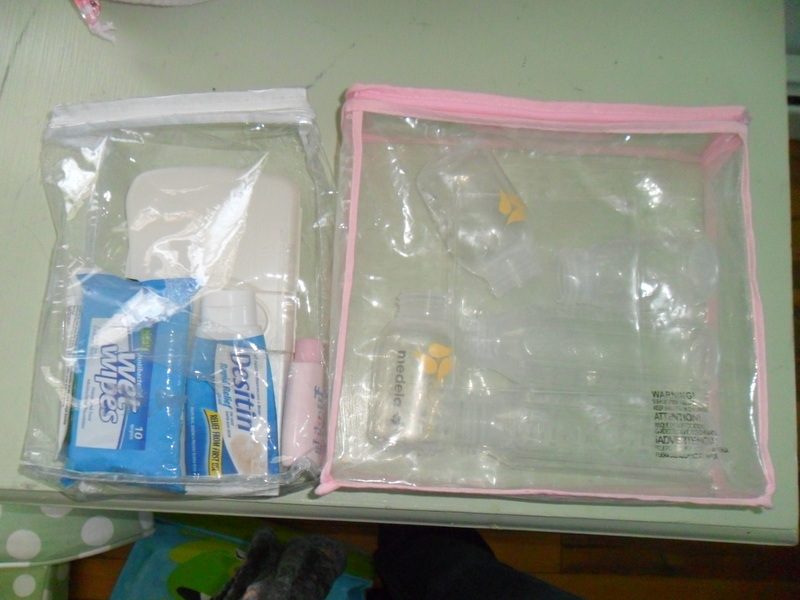 I put a few diapers, a thin wipes case, Desitin, baby lotion, and hand sanitizer in one plastic case. I can easily throw this in my purse with the folding changing pad so when we stop at rest stops I don’t need to bring a huge diaper bag in with me. The larger cases (from complete sheet sets) I use to hold all of her bottles. In addition to these items, I also use more of my sister’s homemade bags to help pack up Olivia’s stuff. She gave me these at my baby shower. 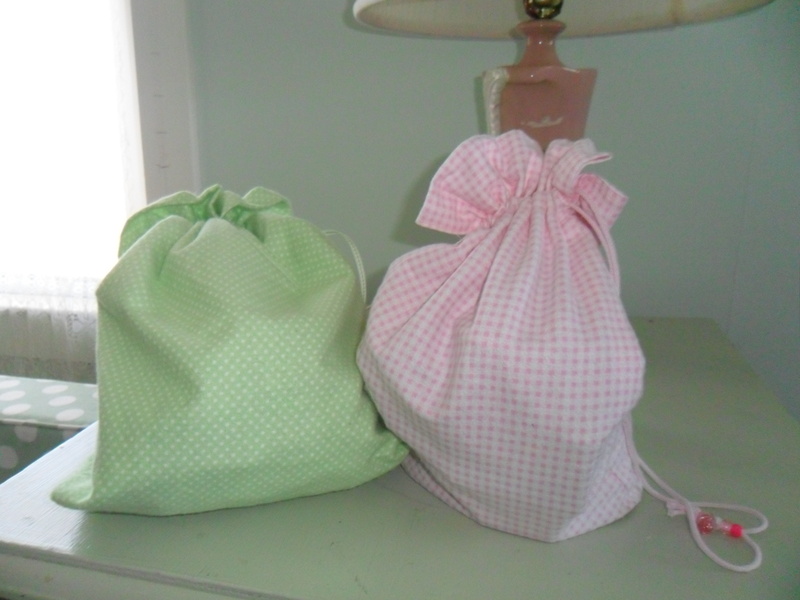 The pink gingham bag I use to put all of her baby food jars and spoons and in the green polka dot bag, I pack as many diapers as I can possible stuff in there! 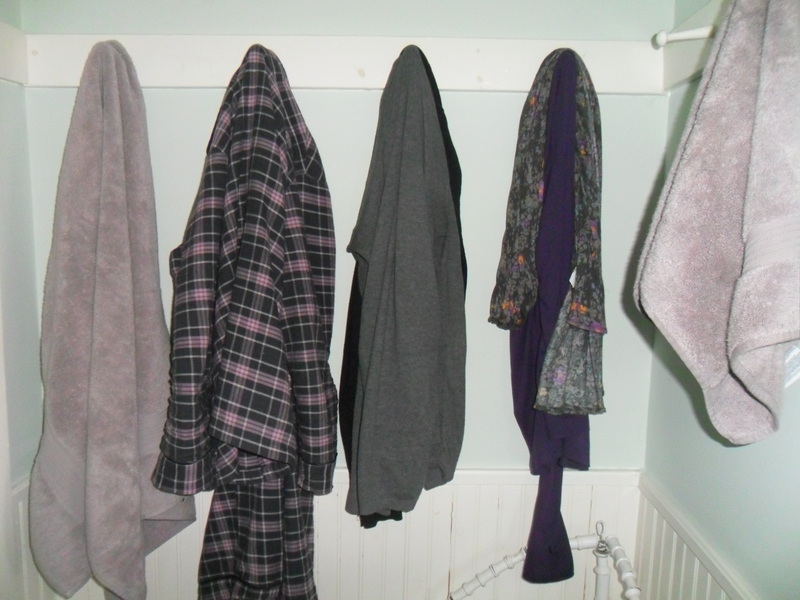 I also snapped this shot of my clothes hanging on hooks during my trip to show you how everything was one color palette (see Practical Packing 1)! Even my pajamas and towels were in the same color family. Not because you have to match when you go to bed or take a shower, but because when I got home I only had one load of laundry to do! I brought two sweaters, grey and black, a purple shirt, a pair of jeans, a few black and white tank tops, a grey and purple scarf, and one pair of black sneakers. Check back again soon … Practical Packing Part 3 will be all about your purse! Leave a comment and let me know about your packing rituals. Bathroom items you must bring? Something you always feel compelled to pack, but then never use? Thanks for stopping by and reading. I subscribe to packing clothes of the same color pallette. 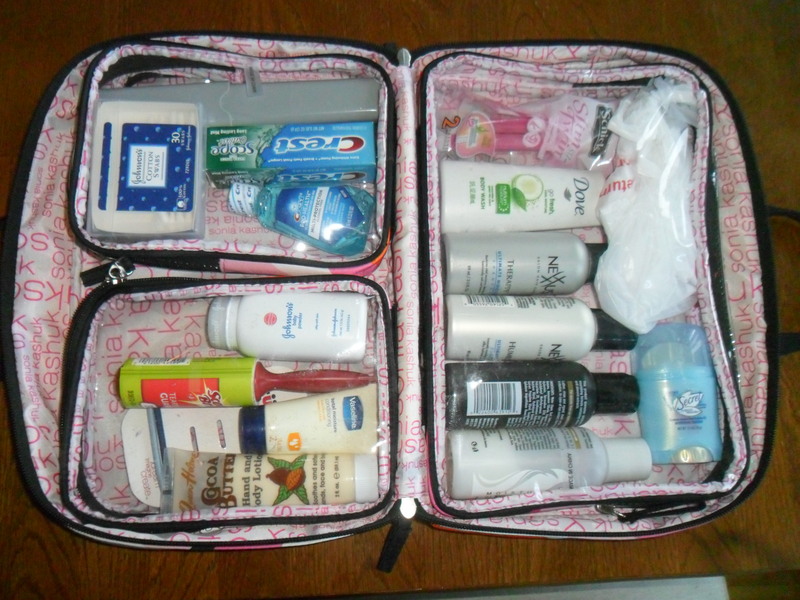 I also like to pack travel size toiletries but they can be expensive and not worth the value. Soooo I own plain travel size bottles and just refill them from my large shampoo or conditioner bottle when packing. Yes – refilling your own travel size is great – you can bring the products you use everyday – without having to pack giant bottles that will take up too much space. Thanks Dana! Question in terms of reusing travel bottles – what do you use to label each bottle? I have been doing the refill game for a bit and had written on my bottles in sharpie, but they got wet and the sharpie wore off. Since all my products looks kind of similar, I’ve just been doing the “smell test” to differentiate between face wash/moisturizer/conditioner and I’m paranoid I’ll use the wrong thing! up almost no space. I have a small zipper pouch where I keep my jewelry and I keep that in my purse or the bag I keep next to me on a plane, train or bus. 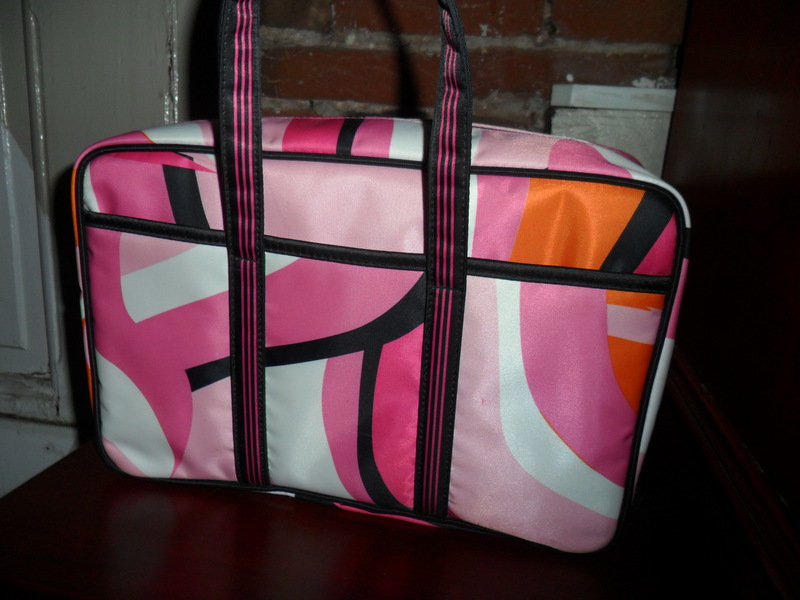 Last, I have a medium size bag, from the company Thirty One, that I keep all my electronics in. All the chargers, camera, and Nook and that stays with me as well.